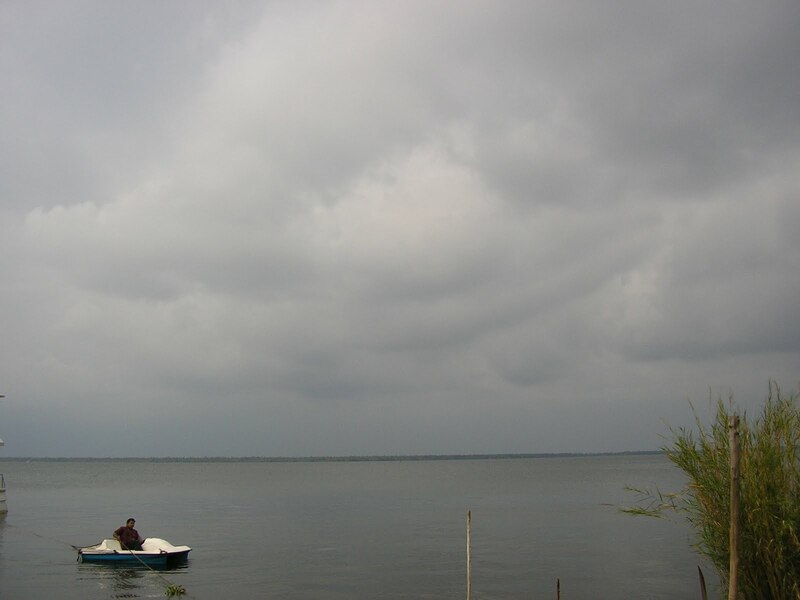 There’s a beast of a storm brewing on the Vembanad lake. Everything’s still, waiting for the onslaught. The jetty’s creaking slowly as if it doesn’t relish what’s coming. Ominous thunder growls at the edges. Occasionally a fork of lightning rips across the dramatically dark sky across the lake. Further out, the waves are getting restless as the squall hits. White-heads form on their lips as they rush along like a blind mob. The destroyed jetty from the storm last evening lies submerged in the water, which is a deep emerald in colour. Now the air’s full of thunder. A ceaseless crackling sound. I can almost feel the electricity on the nape of my neck. The storm seems to be circling around the lake, threatening, looking for a way in. Out deep in the lake, the water’s very choppy. A strong wind drives the waves on relentlessly, which now look like a cavalry charge, moving north to south, the white-heads more prominent. Now, even the water at the jetty is animated. The trees murmur uneasily, as the vaguely armadillo like houseboats out on the lake, scuttle this way and that. Two men from the homestead next door are peacefully oblivious of all this, swimming neck deep in the water, lazily doing backstrokes. The storm is nothing if not punctual. It was supposed to break around 4:30 pm, and now, at 4, its building up pretty impressively. But what if it’s a massive anticlimax, all sturm und drang signifying nothing? I, for one, don’t care. Just the privilege of watching something like this after so many monsoons spent outside Calcutta is enough for me. A massive chain of lightning lights up the lake, and it seems like the world holds its breath for a moment. Then comes the dull crack of thunder and the wind rushes back, blowing in to fill the vacuum. Finally, the rain comes, in scarce fat drops. The wind has picked up, rocking the maroon jetty, which seems to be groaning for mercy, while I stand on it, trying to take pictures. 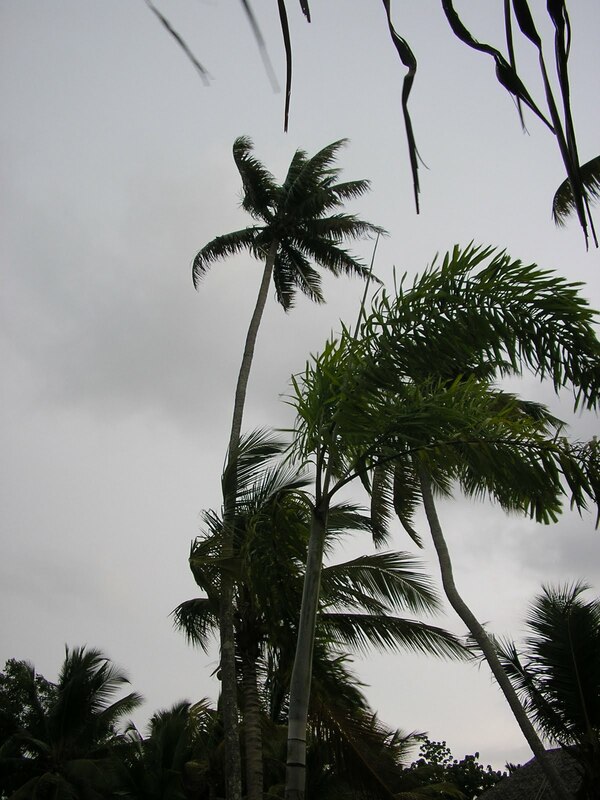 The sky is a grey so deep and dark that it could almost be black. 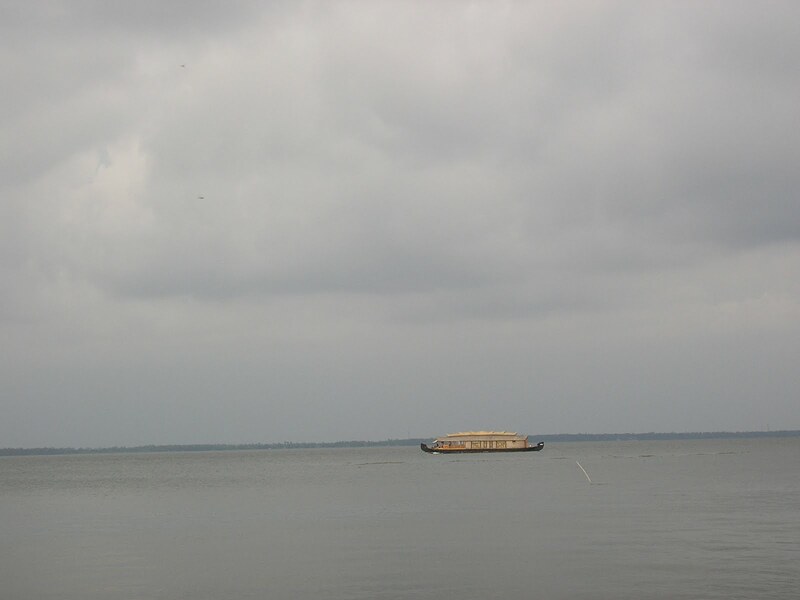 Deep in the lake, two houseboats make their way towards Alleppey in the south by the main channel- where this massive lake’s at its deepest, a ridiculous 12 feet! They’re moving against the full force of the mighty wind, the waves breaking in stupendous white spray against their hulls, which bob up and down, riding the choppy waves. 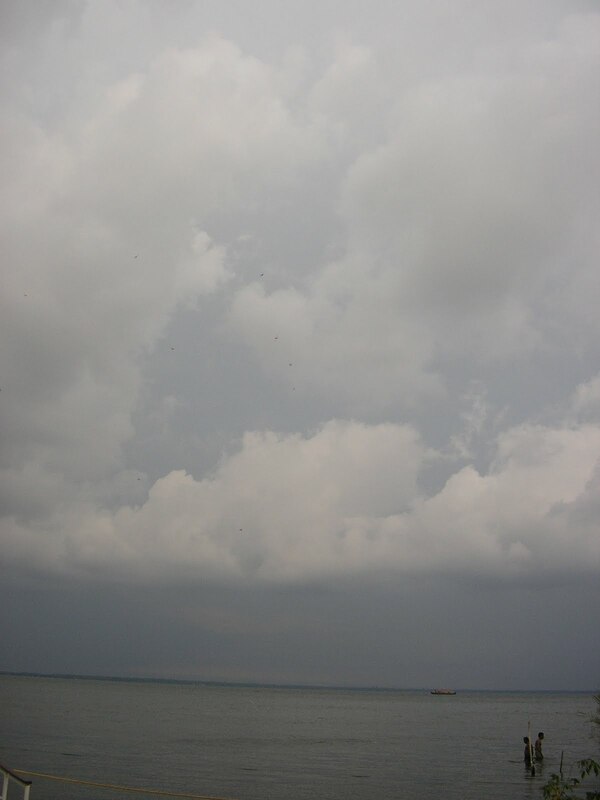 Thunder travels the dark sky over my head, ominous growls riding the charged clouds from one end of the lake. The storm finally hits land, as the trees rustle wildly and the branches lean with the force of the wind; small vicious waves, propelled by that same wind, crash against the shore. A cuckoo somewhere trills in either joy or panic, while the water of the infinity pool beside me flows backwards. The lake is a seething mass of restless waves. Apsara’s (the boat) crew sit on the rocking jetty, dangling their legs; talking amongst themselves with the quiet bonhomie of old friends, watching the storm. The boat stands calm, gently rocking, confident in her low slung infallibility. The crew aren’t taking any chances, especially after the previous day’s mayhem. The boat is lashed securely to the jetty, which in turn is tied firmly to sturdy masts on the shore as well as a couple out in the water. Now the waves change their direction and come straight at the shore, playing with the jetty. 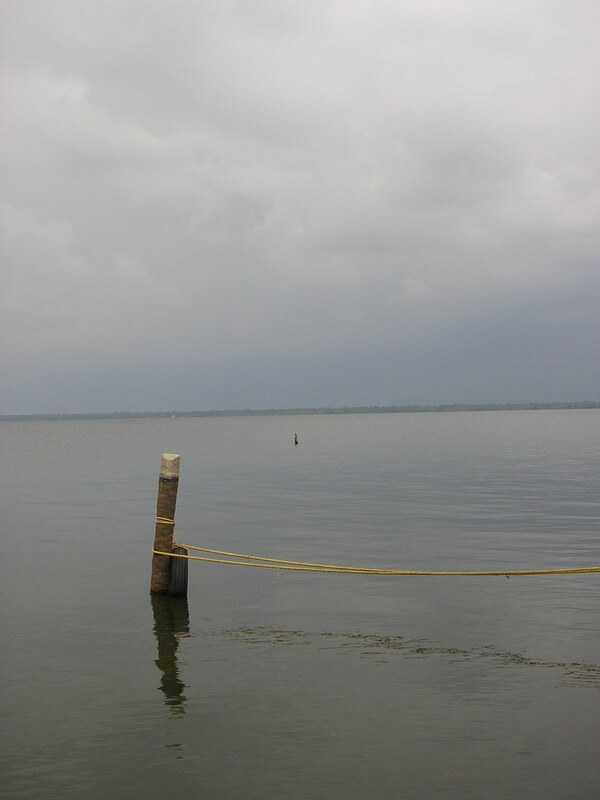 A lone fishing pole stands unperturbed out on the water. In the morning it was playing host to a cormorant, but right now it stands alone and bare, bending slightly in the wind, as the waves rush on by it. A flock of cranes try to fly north over the lake but are driven west by the gusting wind. A white eagle swoops down and flies off with a fish, an outraged crow in hot pursuit. Come here. Lovely storms over here. 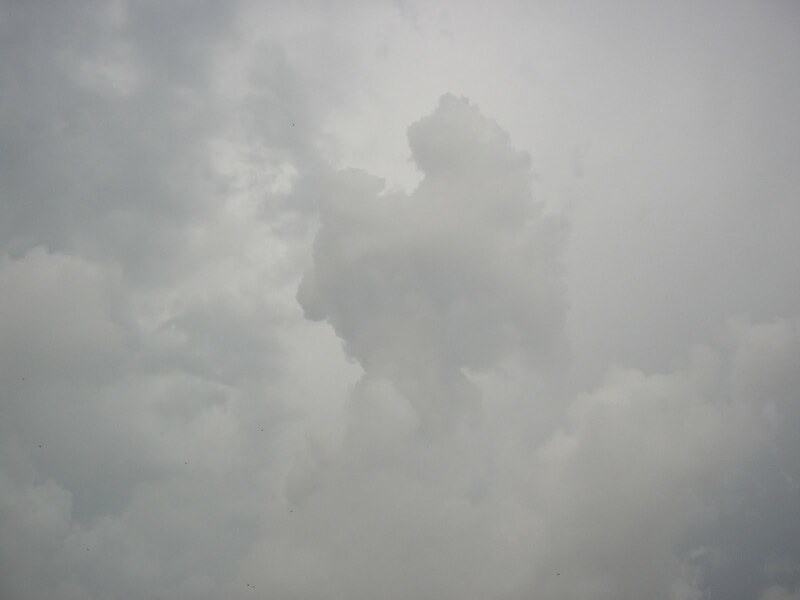 There was a real blaster this afternoon around 4ish, all black clouds and slashing rain. You'd have loved it.Lovely piece, Beq-boy. I felt like I was standing there watching it, almost.